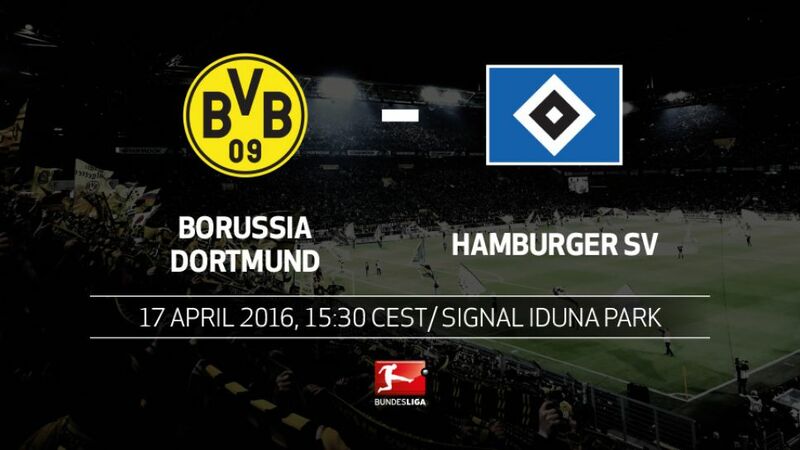 Borussia Dortmund will be looking to keep their faint title hopes alive when Hamburger SV visit the SIGNAL IDUNA PARK on Sunday (kick-off 15:30CEST/13:30GMT). A much-changed BVB were held to a 2-2 draw at bitter rivals FC Schalke 04 in last weekend's Revierderby, slipping seven points behind league leaders FC Bayern München with just five games remaining. Pep Guardiola's side could increase that gap to ten points with victory over the Royal Blues in Munich on Saturday, giving Die Schwarz-Gelben little margin for error against HSV. The Red Shorts go into this one in tenth place but still in need of points to safeguard their status as the only founding Bundesliga member never to have been relegated. Bruno Labbadia's side have a good record against Dortmund, though, winning three of their last four league meetings and drawing the other. Their last visit to the SIGNAL IDUNA PARK ended in a 1-0 victory, with Pierre-Michel Lasogga scoring the only goal of the game. HSV are not safe yet: 16th-place Werder, Hamburg's opponents in the Nordderby on Matchday 31, could move level on points with Labbadia's charges if they win the next two games.However, the team in tenth place after Matchday 29 has only been relegated once (SV Waldhof Mannheim in 1989/90).Since Summer 2012, BVB have suffered more defeats against HSV (five) than against any other Bundesliga club.Dortmund are the only top-flight side yet to lose at home in the league this season.BVB have only gone the whole season without a home defeat on two occasions (1991/92 and 2008/09).No other Bundesliga fixture has yielded more goals (345 in 97 meetings between the two clubs).Hamburg stars Lewis Holtby and Nicolai Müller both played under Tuchel at 1. FSV Mainz 05.